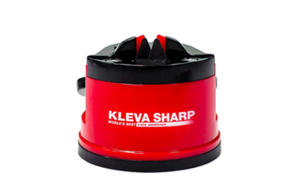 If you are looking for safe, high-quality and reliable knife sharpeners, the Kleva Range of knife sharpeners will have the best suited products for you. Each of the knife sharpeners have a sleek and compact design that take up very little space, and all have strong suction bases. What this means to you is that the blades can be honed hands free, adding another level of safety to the use of our products. 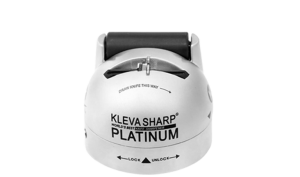 After using our Kleva Sharpener, your blades will be restored to professional quality and you won’t have any problems slicing your food in the future! 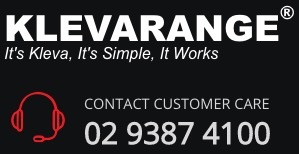 The knife sharpener that launched the entire Kleva Range! It’s simple and compact design along with quick lock handle that activates the strong suction base allows the user to sharpen knives without the risk of cutting hands as they are always clear of the blade. The professional grade tungsten carbide sharpening teeth technology has the optimum sharpening angle to effectively sharpen any dull blade including serrated knives. The Kleva Sharp Original is the perfect tool to bring dull blades back to life. 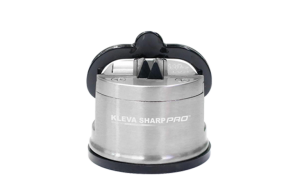 Similar to the Kleva Sharp Original the Kleva Sharp Pro uses the quick lock handle to activate the sharpeners suction base. This results in safe hands free use when sharpening. The Pro sharpeners improved design includes a white honing plate and chrome coloured metal design. The additional honing plate removes all knife fragments microscopic ridges and burrs along the blade to give the blade the smooth and most professional finish. The Kleva Sharp Pro transforms all your old blunt knives into brand new. The third generation sharpener design incorporates a twist and stick suction that will stick to any smooth surface. The Platinum design switches from the original quick lock handle to a twist and stick mechanism which activates the suction cup base. Along with the tungsten carbide sharpening teeth with the perfect sharpening angle that can sharpen even serrated blades the Platinum sharpener includes a finishing barrel. The finishing barrel is to be used by gliding blade over it to remove any nicks and burrs leaving a smooth finish to the sharp blade. Kleva’s first dual sided sharpening system. The systems strong suction base along with its sleek slender design makes it a perfect accompaniment to any counter, fridge and splash back in your kitchen or even in a drawer, shed, fishing box or boat! The system features tungsten carbide tooling and a zirconium oxide stone one of the strongest ceramics on the market. Combing these two methods gives your knives the ultimate sharpening power.